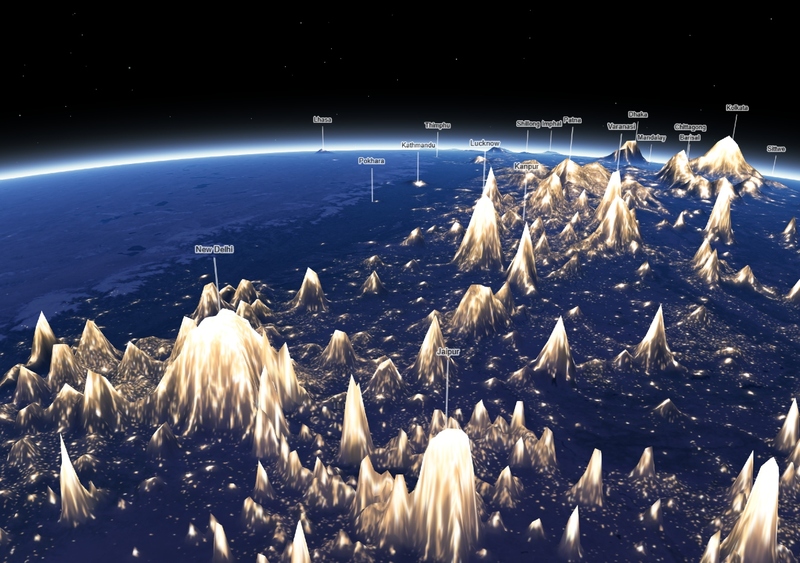 What if Earth’s terrain was created by nighttime lights? Another note: I believe Sarah coined the term “mountains of light“. I like it, thanks! Get that elevation layer wired up to Nasa’s nighttime lights satellite imagery server. Ok fine, if you really want to geek out with me, it comes from the Suomi-NPP VIIRS sensor. The polished and cleaned up pixels are called “Black Marble” and provide a 500m image resolution. This isn’t live data but rather a static composite of images taken at different times. Joshua Stevens and Rob Simmons helped me get a better understanding of the hard work that went in to creating and cleaning up this raw imagery into a beautiful worldwide dataset. Back to the code: for every nighttime light pixel, convert the visual color ramp that goes from dark blue/black to yellow/white into a simple 0-1 number range. For this I used the chroma.js “luminance” calculation. Take the 0-1 number value and multiply it by some huge number! We don’t want 1 meter tall mounds, we want wild and exaggerated mountains reaching high into the sky. Drape anything you want on top of this fake terrain. In this case it made sense to also put the nighttime lights imagery on top of the terrain that it generated. This is a view of northern India, the Himalaya, Nepal, Bhutan, and the Tibetan plateau with our fake mountains at night. If we drape daytime satellite imagery over this synthetic terrain it is hard not to notice something is a bit off with the Himalaya. Viewing the Earth this way wasn’t the original intent of the app, but it is fun to look at if you don’t mind the headache. And here’s a bunch of other links to keep you going down the rabbit hole. 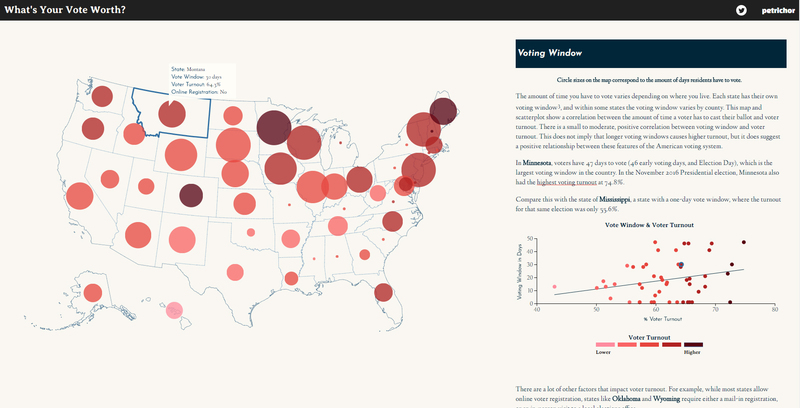 At Petrichor Studio we like to use D3 for our interactive, web-based visualizations. Below are a couple code samples to help you get started making a simple world map in your browser. One approach shows you how to render GeoJSON data in your browser as graphics using SVG, while the other approach uses Canvas. They can be compared side-by-side and I encourage you to identify their similarities and differences. Set up the element that will render the graphics of your map. Choose <svg> or <canvas> and give it an initial width and height. Establish the map projection. We want to make a two-dimensional map, but our geographical features exist on a three-dimensional planet. We’re going from longitude/latitude coordinates to a flat map and D3 needs to know how that should happen. Read up on Map Projections on the Web when you’re ready. 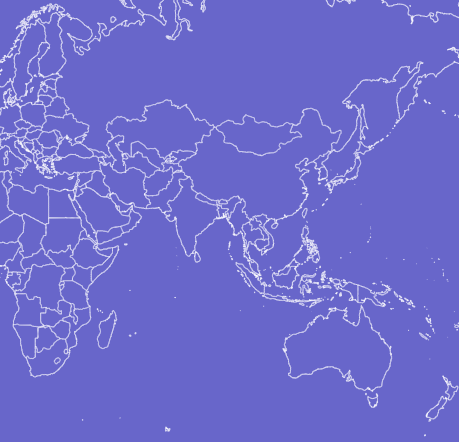 Create a D3 geographic path generator and tell it about the map projection. This is the workhorse that instructs SVG or Canvas how to create two-dimensional graphics out of GeoJSON data. Load your spatial data. The samples below use a network request to load publicly available world country geometries in the TopoJSON format. TopoJSON is more or less a special format of GeoJSON. It just takes 1 extra step to convert from TopoJSON to regular GeoJSON. No big deal. Use the geographic path generator to convert your data into graphics. The longitude/latitude coordinates will be drawn as map graphics in the <svg> or <canvas> element. See the Pen Simple D3 Map using SVG by Jacob Wasilkowski (@jwasilgeo) on CodePen. 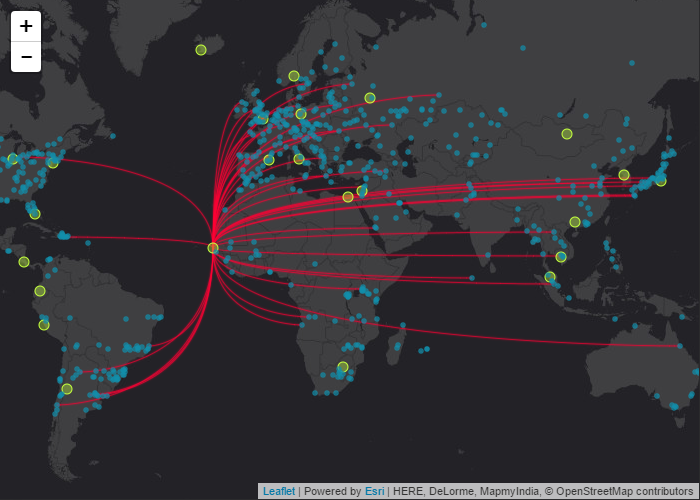 See the Pen Simple D3 Map using Canvas by Jacob Wasilkowski (@jwasilgeo) on CodePen. If you are just getting started with D3 the best advice I can give is simply what worked for me: read other people’s tutorials and code samples, all while experimenting on your own until perceived failures become replaced with tiny successes. The tiny successes will become bigger over time and failures won’t seem so scary or annoying anymore. Good luck! We’ll revisit these topics in more depth by focusing on Map Projections on the Web. It’s time to go retro racer in 2018. Check out this animated map of Formula 1 World Circuits! Even though it is already May, the college basketball excitement and hype of March Madness inspired me to do a sports-related data visualization or mapping project. It was a lot of fun working with animations for the gerrymandering topic in What’s Your Vote Worth?, and it eventually crossed my mind to explore Formula 1 circuits. What we do here is stack all the circuits on top of each other, like misshapen pancakes, and show you only 1 at a time. Even though they’re scattered throughout several continents, here they share the same space and the same map scale. Then, we continually move on to another circuit by morphing between the current shape and the next shape in the pancake stack. The world reference map is also updated to provide geographical context. An argument for doing this (other than just because I can) would be that you can directly compare the circuits’ shapes, sizes, and orientations, without having to find and navigate to each circuit separately as with a traditional web map. NCAA Basketball: Who’s Come the Farthest? 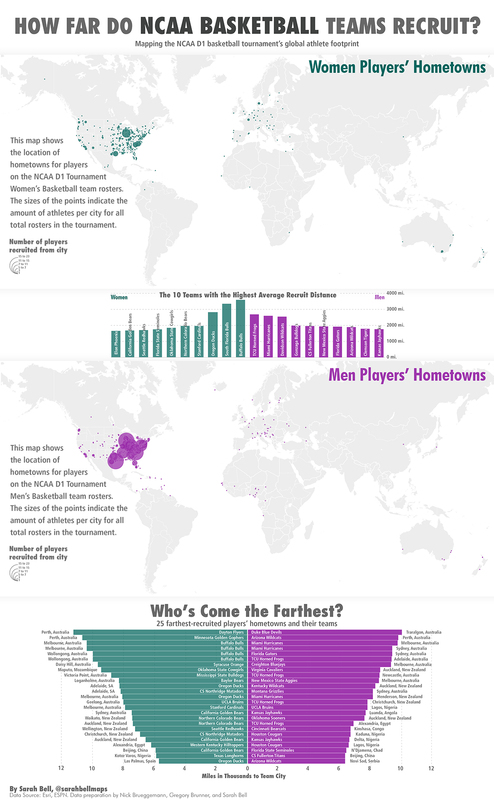 I decided to map the women and men athletes’ hometowns as graduated symbols, where hometown sizes are based upon the amount of athletes that come from there. The men and women hometown maps are separated in order to more easily identify the different locations. These maps started out with world city points and labels, but I removed them for the sake of decluttering the visualization. I was able to identify the lat long of the athletes’ hometowns using ArcGIS. I then calculated the distance from each player’s hometown to the city that their team is located; here is a really handy blog post that someone wrote eleven years ago; I often refer to that post when calculating distances between lat long coordinates. Calculating the distance of each athlete’s hometown to their team city allowed me to identify the average recruit distance per team, along with the farthest (and closest) recruit distance. Other than the maps themselves, I haven’t done any visualization for teams on the lower end of the average recruit distance. (Maybe in few days ?) There are a lot of players whose hometown is also the the same as their team’s city. *Check out our What’s Your Vote Worth? data viz storytelling to see this effect in action. Tired of falling down into web maps? Zooming in, zooming in, and zooming in from outer space down to the Earth’s surface got you feeling sad? Here’s another idea: demand that geographic features come up to you. Web maps typically require you to zoom in and may give the sensation of “falling down” or “diving in” towards the Earth’s surface. Why not make this everyday interaction become more user-focused? Click on a state to get started. See the Pen Bring Up State – D3 by Jacob Wasilkowski (@jwasilgeo) on CodePen. 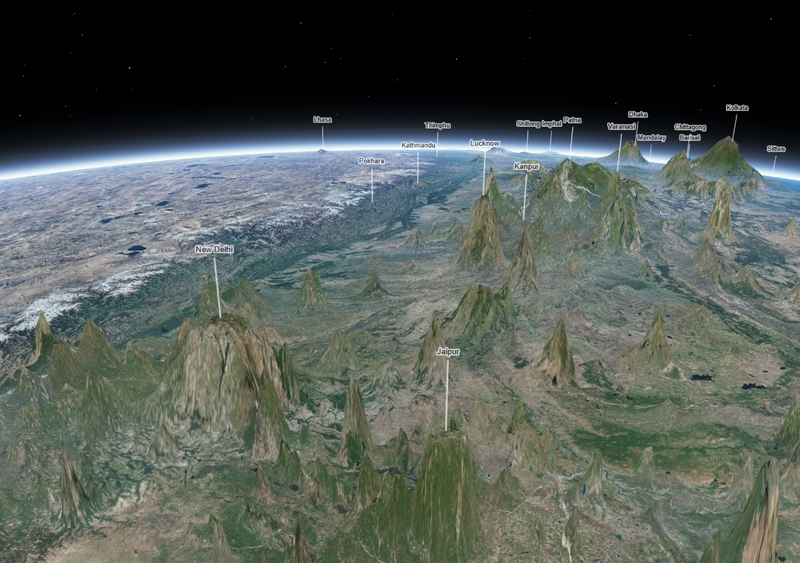 Just click—no need to fly down closer to the Earth—and the visualization will do the heavy lifting of bringing up the geographical feature directly to you. *This post was written in February 2017. It was the first collaborative geovisual project between Jacob and myself. We have since presented this mapping method at the North American Cartographic Information Society annual conference in Montreal, Quebec in October 2017. The lack of empirically based cartographic design principles results in the freedom of relying on intuition and aesthetics. So for all the mappers out there reading this, I hope you find extreme freedom in knowing that this Canvas-Flowmap-Layer is only one of many ways to map the journey of phenomenon from one spot on Earth to another. It is one method that we are quite comfortable in presenting, and have successfully implemented versions of the Canvas-Flowmap-Layer in a few real world scenarios. While straight lines are not inherently ugly, an overlapping or convergence of them across a global dataset can be. A series of Bezier curves created with the same formula, even when displaying an over-abundance, has a mathematically congruent flow that greatly improves the map’s aesthetics. 2. The single formula that is used to draw each of the Bezier curves means that map readers can immediately know the direction of the line without having to add animation (explained below). 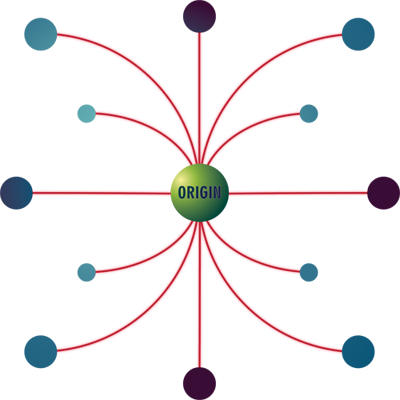 As you can see from the image below, if the end point is due north (or south, east, or west) of the origin, the resulting curve is a straight line. Each point is added to the map twice – the first instance of each point is an invisible “ghost” Esri graphic with associated attribute data, geometry, etc. We call these “ghost” graphics since the symbology has no outline or fill color. These ghost graphics are required for 1) having a to- and from- point from which to connect the Bezier curve, and 2) allowing the points to provide functionality and interactivity that developers and users are familiar with. The second instance of the points is what you actually see on the map. Each one of these points has the same radius as their ghost counterparts that lie directly beneath them, but are created by finding the screen coordinates of the ghost graphic and then placing them onto the HTML canvas. By doing this, we are able to draw the curved lines that connect the points onto the canvas. I was drafting Bezier curves onto prototypes before this became an actual interactive map layer. Once it came time to add the curves to the map canvas there was no shortage of resources for figuring it out. Here is one of the many useful out there. The lines are added to the HTML canvas by finding the screen coordinates of the points, and then using those coordinates in the .bezierCurveTo() canvas method. The convexity or concavity of the curve does convey the direction of the flow line, but the directionality won’t be easily intuited due to its novelty. In the event that this mapping technique catches like wildfire, we can delete the second part of the previous sentence. In the meantime, we’ve added line animations, similar to the “ants marching” effect, with a nice easing effect inspired by this Kirupa post. The Canvas-Flowmap-Layer uses two separate lines when animation is added, although two lines are not required to achieve animation. The first line is the solid static Bezier curve, and the second line is the dotted or hashed animated Bezier curve that sits on top of the first line. Those animated traveling dots are actually a curved line with really a big gap setting in the hash pattern. You’ll find out a lot more about how the Canvas-Flowmap-Layer was constructed by diving into the code, and checking out the comparison and main demos. Projection – This is not a limitation, just a bit of information. This particular instance of using a single formula Bezier curve for flow mapping onto the canvas was implemented with Web Mercator projection. This cartographic method is not limited Web Mercator, provided that you are mapping a projected map and grabbing the correct screen coordinates from your start and end points. Connection vs. route – The Canvas-Flowmap-Layer is ideal for the flow of things, where the route can be abstracted to a simple conveyance of start point connected to end point. Our data did not contain route information. 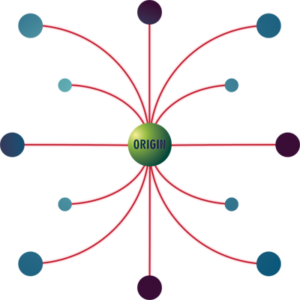 When mapping thematically for things like the flow of ideas, phone calls, or even the logistical flow of things that – while they do take an actual route – can be reduced to its mere start-end connectivity. (In fact, oftentimes adding actual routes can clutter the map with chart junk). There are things to note, though, when giving precedence to connectivity over actual route. Namely, for example, when you have things from Seattle being shipped to Tokyo, but the flowline travels across Europe, Kazakhstan, and China on its way to Tokyo, when the shipment might have actually traveled across the Pacific Ocean. Jacob has cleverly built in a cool feature where the flowline updates as you pan the map so that most/all of each flowline can be viewed (at the small scales). It is totally feasible to add this sort of directional information to your data (where true direction matters). It might be pretty prudent to restrict users to your dataset’s minimum and maximum extent as much as possible. We didn’t add that restriction to our sample maps.